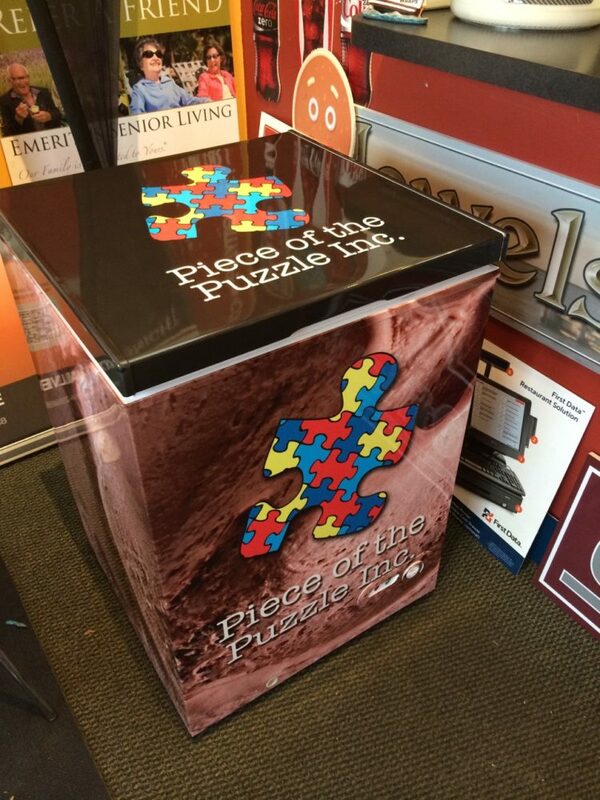 Piece of the Puzzle, a local non-profit working with autistic students at Southern Regional School District needed their ice cream freezer display to stand out in local retail stores. Typestries deigned a vinyl wrap featuring photos of their hand made, homemade ice cream, and the Piece of the Puzzle branding logos. We printed the designs using HP Latex ink onto 3M controltac 180c wrap vinyl with 3M 8518 gloss optically clear lamination for beautiful gloss, clarity, and durability. Since installing the wraps onto the freezers, and immediate increase in ice cream sales took place, making these wraps a very effective investment in the brand marketing for Piece of the Puzzle. .